Welcome to our periodic refresh of the TouringPlans Trip Planning 101 series, where we walk new WDW trip planners through some of the basic components of getting ready for a trip to Walt Disney World. 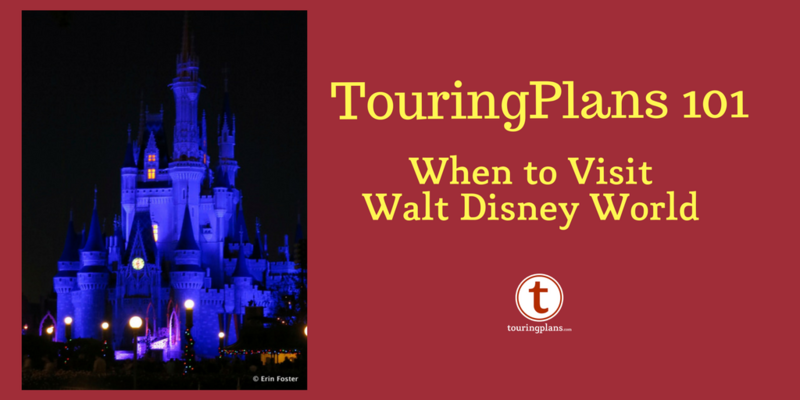 Here we’re looking at factors to consider as you decide when to make your Disney visit. The first step in planning a visit to Walt Disney World is deciding when to take your trip. This basic decision can have a big influence on the pace, mood, and cost of your vacation. Here’s a guide on how to choose the best timetable for your Walt Disney World experience. We’ll do this from two perspectives: a family with kids in school and adults not traveling with children. 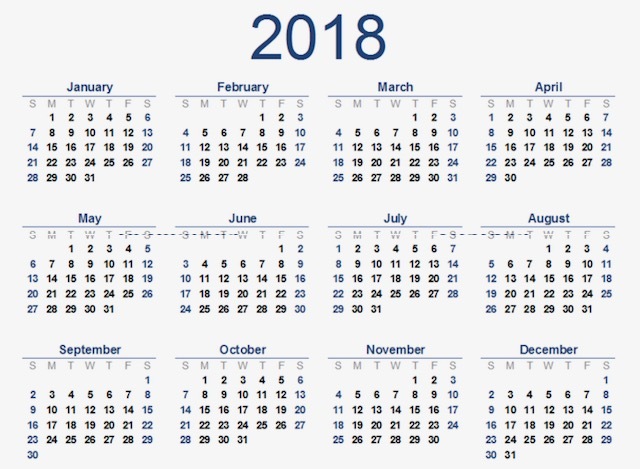 A blank calendar. I like having one where I can see whole year in front of me, such as the 2018 calendar above. Your school district calendar (if applicable). Calendars for your family’s activities: sports, church groups, dance recitals, etc. The Walt Disney World attraction closures schedule. Access to information about Disney’s special events each month. There’s a great section about this in the Unofficial Guide to Walt Disney World. Access to your favorite weather website, such as weather.com. Access to your favorite airline website, travel aggregator website (Expedia, Travelocity, etc. ), or travel agregator app (Kayak, etc.). Access to your favorite Disney discounts website, like MouseSavers.com. Several colored pencils, highlighters, or markers. Before you sit down with the calendar, you’ll need to ask yourself some basic questions. Are travel dates limited to school vacation dates? Or are you willing to take the kids out of school for a few days, or more? Are you willing to have your child miss sports team events or similar activities? Is there a big tournament during your school vacation? Are there work-related dates that prevent travel? For example, you’re an accountant who can’t travel during tax season. Are there family-related commitments that prevent travel? For example, your sister’s wedding is in August so you can’t go to Walt Disney World then. Are there religious observances that prevent travel? For example, you need to be home during Easter. Are there specific events at Walt Disney World that you’d like to experience? For example, Food & Wine Festival, Flower & Garden Festival, or Mickey’s Very Merry Christmas Party. Does weather play a factor in your vacation enjoyment? For example, you don’t consider it a vacation unless it’s warm enough to swim. Or you’re uncomfortable carrying your toddler when it’s more than 80 degrees out. Are there medical reasons not to travel at certain times of year? For example, your allergies flare during the spring. Or you become short of breath at temperatures above 85 degrees. Do you have any absolutely 100% must-do attractions? For example, your son is obsessed with Star Wars. His (and thus your) vacation will be ruined if he doesn’t experience the Star Tours attraction. Are there other people’s schedules to consider? For example, your dog walker is unavailable in the summer. Or your mother-in-law is traveling with you and must be consulted. How important are low crowd levels to you? How important is low cost to you? Are there any habits of my traveling party to consider? For example, your teenagers refuse to wake up early on vacation, so you’d prefer travel when the parks are open late. Are there special celebrations to consider? For example, your daughter has always wanted to be at Walt Disney World on her birthday. If the reason that you’re visiting Walt Disney World is for a specific event, perhaps to run in the Walt Disney World Marathon, then selecting your travel dates is going to be easy. But most folks will have some more challenging choices to make. For example, while I personally make several annual research trips on my own, my family also likes to take one long trip to WDW each year (a full week), plus possibly a long weekend bonus trip. Now that the kiddos are older, we understand that we may not always be able to travel together as a full family unit, but we’d really like to try to make that happen in 2018. The ultimate goal is to find a period of at least 5-7 days where we could all travel together. While we occasionally pulled them out of school for travel when they were young, for us this is not an option during college. 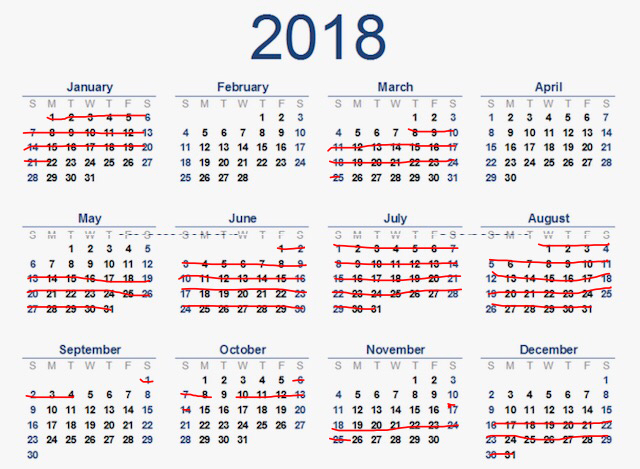 I’ve redlined all the dates in which I know that any of the girls will be in school. Daughter J is traveling with her college choir during part of her spring break, so she will be unable to travel then. Also, extended family will be with us attending daughter C’s graduation in June. We can’t travel during this time or immediately after. I’ve marked out these dates in March and June in brown. It’s plain to see that the only viable options we’ll have this year to travel as a full family of five are Thanksgiving, during the summer, and Christmas. We decided to pass on Thanksgiving because the trip would have to be fairly short and there are some older relatives that we mostly see at Thanksgiving and would like to protect that time. This leaves summer and Christmas, both of which have some disadvantages. A peek at any weather app will tell you that summer in Orlando is close in temperature to the center of the sun, a situation which makes my husband more than a little cranky. While the climate is more mild in late December, the TouringPlans Crowd Calendar makes it plain that this is an extremely busy time of year, with generally higher prices in place, both of which make me more than a little cranky. While neither of those options are ideal, in other circumstances we might have opted for the summer because the girls like to be at the parks late in warm weather. However, the other confounding factor that none of my daughters have yet to figure out their own summer plans. After a quick family chat, we’ve decided to avoid planning a vacation in the summer to provide them with maximum flexibility to find a job, internship, or class that best meets their needs for education and earning. That leaves December. We’re going to book our family trip for the Christmas holiday 2018. We’ll go into it knowing that we’ll probably spend lots of time at the resort relaxing rather than fighting the masses at the parks. I’m looking forward to it. While having my daughters in college has narrowed our options for planning family travel, it has also opened up more possibilities for my husband and I to travel alone. (Huzzah!) We decided to plan a trip for just the two of us this year in addition to the family trip. To plan this one, I looked at the calendar with reverse criteria than previously. I’ve redlined the times on the calendar when any of the three girls are home for any sort of school break. 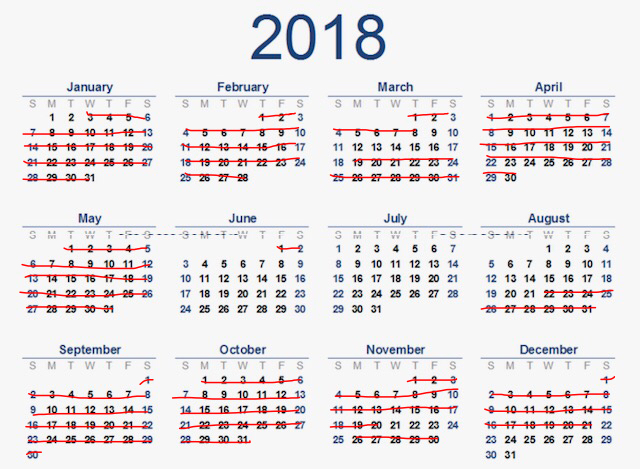 Chatting with hubby, we decided to eliminate November and December, due the proximity of those dates to the family trip. We eliminated September because it’s often still quite hot during that time. Then our next stop was the Crowd Calendar. Some of our possible dates are high crowd times due to national school holidays. We wanted to avoid these times, because as adults traveling without kids, we can. This kicked out President’s week in February and much of April, leaving early February and October as key contenders. Either early February or October will satisfy all of our date selection criteria. Because we life in a Northern state and it is currently FREEEEEZZZZING right now, we chose February, which will give us a tiny light at the end of the wintry tunnel. 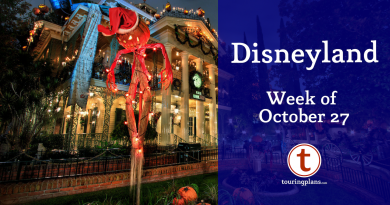 However, other planners in a similar situation might prioritize seeing the fun fall décor and the experience of Mickey’s Not So Scary Halloween Party, thus landing on October travel dates. Our final step in choosing our exact travel dates was to play around with the websites of our favorite airlines. We found that by shifting our travel dates by just a day, we could save several hundred dollars in airline fees. Sunny Florida, here we come! Do you have a unique process for selecting WDW vacation travel dates? Do you have a special way of selecting when you vacation? Let us know in the comments below. As we are 2 adults, its not too difficult to schedule time off together, the trick for us is to find times that are quiet at work so we are not stressed thinking about work on vacay, next we look at your fantastic crowd calendar and upcoming events for quiet times, and finally we check out historical weather patterns. In the past we have gone to WDW in September and DL in October, this year its WDW in January. The only thing that we find sad is that we cannot be unplugged during a Disney vacation, this is the whole reason we like to get away. Time for the Magic Smart Band?? I’m happy that you consider school schedules in this; so often with these types of articles, the authors completely ignore school because those times are typically much busier at vacation destinations.